and there is room for you in this religious community. Sunday, April 28, 2019 at 10:30 a.m. Together the congregation will make a new set of tiles to add to the tile wall in the hallway. From time to time we gather together for workship, rather than worship. Come decorate tiles and celebrate community. Who we are includes an ongoing pursuit for social justice; this means we advocate through volunteer projects, dialogue, and by giving to our community. Although we come different walks of life, this community shares a passion for the inherit worth and dignity of individuals. We have activities! You can plug in to social, spiritual, and volunteer experiences to your heart's content. 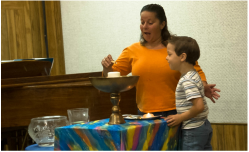 Interested in learning more about Unitarian Universalism and the congregation?